The wood turtle is on the western edge of its range in Minnesota. It occurs north into Ontario, east to Nova Scotia, and south from northern Iowa to northern Virginia. Because of its dependence on forested riverine systems and well-drained soils, the wood turtle was probably never uniformly distributed in the Upper Great Lakes Region, but was locally abundant in areas with optimal habitat. Throughout its range, many populations have become impacted or extirpated by human activities. In Minnesota, factors contributing to its decline include the loss or fragmentation of riverine forests related to agriculture, timber harvest, road construction, and development; siltation of streams caused by excessive run-off; and flooding of nesting areas. Prime wood turtle habitat is also attractive to recreationists, leading to increased collection and road kills. In addition, human activity attracts predators into areas because of trash left behind. An increase in predators can in turn impact wood turtle populations, with predators digging up nests or eating young turtles. All of these problems are compounded by the wood turtle's low reproductive potential, resulting in few juveniles recruited into the population. The wood turtle was designated a threatened species in Minnesota in 1984. The carapace (upper shell) of an adult wood turtle averages 14-20 cm (5.5-8 in.) in length (Oldfield and Moriarty 1994) and is comprised of individual plate-like scales or scutes that have concentric grooves that resemble growth-rings on a tree. Yellowish-colored skin on the limbs and underside of the neck is typical of Minnesota wood turtles, but the color can range from yellowish-orange to red in turtles further east. Adult male wood turtles can be distinguished from females by their larger, wider head; longer, thicker tail; and concave shape of their plastron (lower shell). The wood turtle is largely aquatic, preferring small- to medium-sized, fast-moving rivers and streams with adjacent deciduous and coniferous forests. The substrates of wood turtle streams typically consist of sand or gravel. Wood turtles will occupy adjacent alder thickets, forest, and grassland habitat for basking and foraging, typically staying within 1/4 mile of the river or stream. In southeast Minnesota, wood turtles are often found foraging in agricultural fields along rivers. Sandy, sparsely vegetated areas that are not prone to flooding and have ample exposure to direct sunlight provide important nesting sites. Wood turtles overwinter in rivers or streams where turtles may gather in bank undercuts or near log-jams. They become active by late April, basking on logs or riverbanks on sunny days. Breeding is most frequent in the spring and fall. In late May or June, gravid females dig nests in exposed sandbars, cut-banks, or other open, well-drained areas and lay 4-18 eggs (Ernst et al. 1994). Hatchlings generally emerge in late August or September. Wood turtle nests are destroyed by a variety of predators including raccoons (Procyon lotor), skunks, and foxes. Hatchling turtles traveling from their nest to water often fall prey to birds and other predators. Fish and snapping turtles (Chelydra serpentina) eat many hatchlings that manage to reach water (Harding and Bloomer 1979). Females lay only 1 clutch of eggs per year, and may not nest every year (Ross et al. 1991). The wood turtle is very long-lived, maturing between the ages of 14 and 18 years (Farrell and Graham 1991; Brooks et al. 1992). During the summer, the wood turtle will forage on land, typically staying within 150 m (492 ft.) of a river and occupying a home range of less than 3 ha (7.4 ac.) (Buech 1994; Ernst et al. 1994). The use of upland habitat varies widely among individual turtles (Ernst et al. 1994). The wooded floodplains and uplands adjacent to wood turtle streams supply a variety of foods, including berries, succulent leaves, mushrooms, insects, and earthworms. Habitat degradation and destruction, illegal collecting for the pet trade, and increased mortality from road kills and predation have impacted wood turtle populations throughout their range. This late maturing species has low recruitment potential and is highly vulnerable to the loss of any individuals from the population. Conservation efforts should include identification of viable wood turtle populations and the protection of upland foraging habitat and nesting sites. Activities affecting water quality and water level management must also be addressed. Preservation of high-quality wood turtle habitat is dependent upon reasonable floodplain conservation techniques and zoning restrictions, including maintaining water quality; controlling sedimentation; restricting pesticide use near waterways; enforcing minimum set-back requirements and stream-side buffer zones; and use of best management practices for timber harvest, livestock grazing, and agriculture. Damming and channelization change the substrate and flow characteristics of streams, making them unsuitable for wood turtles. Certain fisheries management activities, such as streambank stabilization and the digging of sand traps in trout streams, can also negatively alter wood turtle habitat (Harding 1991). Woody debris in rivers provides turtles with cover and basking sites and should be retained, when possible. Recreationists can impact wood turtle populations through increased collecting and by attracting predators to food and trash discarded at picnic areas. Trash left on sandbars and islands where turtles nest can attract skunks and raccoons that may also dig up and destroy turtle nests. Limiting recreational use of streams in prime wood turtle habitat may be necessary. Lastly, wood turtles are susceptible to being killed by farm machinery while foraging in agricultural fields. Several conservation efforts have been undertaken to determine the distribution and abundance of wood turtles in Minnesota. Surveys have been conducted by the Minnesota Biological Survey and Nongame Wildlife Program, and by the U.S. Forest Service to determine the extent of wood turtle distribution in Minnesota and to locate nesting sites. The U.S. Forest Service has conducted research on movements, habitat use of adult turtles, and nesting success. The Nongame Wildlife Program has conducted research on movements and habitat use of adult and juvenile turtles. Wood turtle management recommendations have been developed by the DNR for natural resource managers working in areas with known wood turtle populations. Brooks, R. J., C. M. Shilton, G. P. Brown, and N. W. S. Quinn. 1992. Body size, age distribution, and reproduction in a northern population of wood turtles Clemmys insculpta. Canadian Journal of Zoology 70:462-469. Buech, R. R. 1994. Looking for a few Wood Turtles. The Minnesota Conservation Volunteer 57(334):38-45. Ernst, C. H., R. W. Barbour, and J. E. Lovich. 1994. Turtles of the United States and Canada. Smithsonian Institution Press Washington, D.C. xxxviii + 578 pp. Erpelding, B. 1998. Wood Turtle surveys in the Cannon River Watershed. Report to the Minnesota Department of Natural Resources. 2 pp. Farrell, R. F., and T. E. Graham. 1991. Ecological notes on the turtle Clemmys insculpta in northwestern New Jersey. Journal of Herpetology 25:1-9. Harding, J. H. 1991. 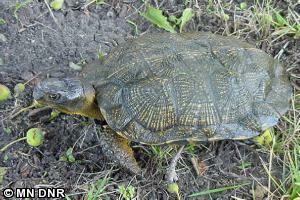 A twenty-year Wood Turtle study in Michigan: implications for conservation. Pages 31-35 in K. R. Beaman, F. Caporaso, S. McKeown, and M. D. Graff, editors. Proceedings of the first international symposium on turtles and tortoises: conservation and captive husbandry. Chapman University, Orange, California. Harding, J. H., and T. J. Bloomer. 1979. The Wood Turtle, Clemmys insculpta . . . a natural history. Bulletin of the New York Herpetological Society 15(1):9-26. Ross, D. A., K. N. Brewster, R. K. Anderson, N. Ratner, and C. M. Brewster. 1991. Aspects of the ecology of Wood Turtles (Clemmys insculpta) in Wisconsin. Canadian Field-Naturalist 105:363-367.